Today at dance class, Sophia, Shakira, and I found out the best news ever: Our dance group is going to be part of the Thanksgiving Day parade! But now our special drum is missing and we can't do our dance without it! Where could it be? Emma and her friends want to put their best foot forward at showtime, but first they'll have to solve their biggest mystery yet! Ida Siegal is an award-winning journalist and on-air reporter at NBC's flagship station in New York City, WNBC. She won an Emmy award for her coverage of Super Storm Sandy. Ida also lives in New York City, with her husband and their two children. 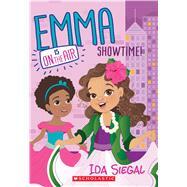 The Emma Is On the Air series marks her children's book writing debut.